Making your own candles can be a great craft activity for children and adults alike. Making your own soy candles is also a great eco-friendly alternative to the more common petroleum-derived wax candles. This is because soy wax is more economical - it burns slower than normal candle wax, meaning that you get more 'burn time' per candle and need to use less candles overall. If you burn a lot of candles, you'll be pleased to know that continued exposure to soy is safe and relatively soot-free, whereas normal candle wax releases soot that can contain toxic and carcinogenic properties. Soy also burns at a lower temperature, which means that lead-free cotton wicks can be used. Another benefit of using soy is that it comes from a sustainable and renewable resource, whereas many shop-bought candles are made from paraffin, which is derived from the oil refinement process. To make your own simple unscented candles, you'll need to get hold of soy wax flakes. These can be sourced directly from dedicated candle making or craft shops online or on the high street. You'll also need to buy candlewicks with metal disc ends, bearing in mind that as aforementioned, you can opt for lead free pure cotton wicks when using soy wax. You'll also need some heat resistant jars - any washed jam jar or food jar should suffice, as well as some superglue and scissors. To begin making your candle, you can take the superglue and add a small amount to the metal of an individual candlewick and stick centrally at the bottom of your candle jar. Depending on the glue's instructions, you'll need to hold the disc in place for between 30 seconds to two minutes whilst the glue dries and fixes. If you wish to re-use the jar once the candle has finished, you can opt to leave the wick suspended in the wax without fixing it. However, it will need supporting until the wax has set. You'll then need to set up a bain marie or "double boiler". A basic version of this is to have a heat-resistant bowl sitting over a saucepan of gently simmering water. The soy flakes can then be poured into the mixing bowl and gently heated until they completely dissolve into liquid form. The soy wax should then be removed from the heat and carefully poured into the candle jar. Whilst pouring, keep the wick pulled taut and vertical until the wax has set enough to support it. Using the scissors, you can then trim the wick to around 2cm (about an inch). You can make your own scented aromatherapy candles by adding essential oil into the candle wax during the melting process. Lemon essential oil will work well as an insect repellent during balmy summer evenings. Lavender and chamomile essential oils can help to create relaxed atmospheres. You could also try zesty cinnamon and ginger combined with cedarwood or juniper for more festive candles, or why not opt for peppermint or eucalyptus essential oils to help revive and relieve stuffy noses? There are no end of options for creating scented oils - mixing your own essential oil blends for specific rooms or atmospheres is a hobby in itself. Bear in mind that instead of just creating jar candles, you could also opt for floating candles instead. You would need to source floating candle moulds, which tend to be shallower in depth. 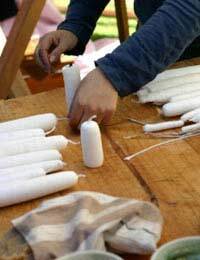 Likewise, pillar candles ('church candles') will also require specific moulds. A budget option for making recycled candles is to collect together any scraps of 'spent' old candles that have almost finished burning. You can then melt the different waxes together in a double boiler (bain marie) and then simply pour into a jar as normal. @Edward the Bee. We cannot recommend individual suppliers unfortunately but if you type in the phrase "latex candle moulds for church candles" into a search engines you get a lot of useful results. I am searching for a Latex rubber mould for a straight church candle 12" x 1" can you help me locate a source for them or if they could be manufactured ? Many Thanks. Edward.